Long summer days leave kids hungry and bored but before whipping up the same old lunch of PB & J or grilled cheese, consider these fun and healthy food ideas for kids. 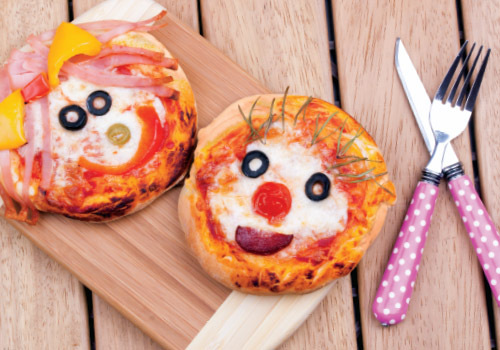 Combining a craft with a healthy snack will both entertain and fill stomachs! Encourage creativity, and we promise the kids will want to eat these vitamin-packed fun foods every day! Whether school or day camp is in session, pack one of these fun snacks in your child’s lunch for an exciting midday surprise! Most every kid loves pizza. Try making a nutritious version at home by using whole wheat pizza dough and low fat cheese. Allow the kids to select the fruits and veggies to use as toppings. Let the kids help you put it together for all to enjoy. There’s no limit to the combinations! Kids love to help out in the kitchen. Buy some wooden skewers or popsicle sticks and some of their favorite fruits. After cutting up the fruit, sit the kids down and let them make their own kebab creations. A side of flavored yogurt will add some special zing! Instead of the usual popsicles, try a homemade and healthier version. All you need are some small paper cups and popsicle sticks. Choose your favorite yogurt or natural juice, fill the cups, and freeze for a refreshing treat. and you’ll never look back. Yum! Let your children discover their taste buds along with their artistic talent. A great culinary masterpiece can begin with bagels and low fat cream cheese. Put out some healthy toppings for the bagels and encourage their creativity. Who’s afraid of a little bug? This is a delicious (and easy) treat the kids will love. Simply wash and thoroughly dry a celery stick. Spread peanut butter or a peanut butter alternative into the natural curve of the stalk. Top with raisins, coconut, nuts, cereal or dried cherries.